He was a brave soldier who is Oxfordshire’s earliest identifiable resident. But for centuries the tombstone of Roman soldier Lucius Valerius Geminus was buried in pieces in the foundation of a stone wall in a field between Bicester and Wendlebury. Now, the tombstone has been put back together – literally piecing together Geminus’ story. The two metre high tombstone, uncovered in 2003 near the site of the Roman town of Alchester, is the first in the county to reveal a biography of a Roman inhabitant. It is now to go on display. Dr Chris Ferguson, Curator of Archaeology at Oxfordshire Museum Service, said it was an exciting find. He said: “This provides the first known biography of any person living in pre-medieval Oxfordshire. He is, arguably, also the earliest legionary veteran attested in Britain, also the earliest recorded European (Italian) living in the county. The pieces have been in storage at the Museum Resources Centre, in Standlake, until recently. 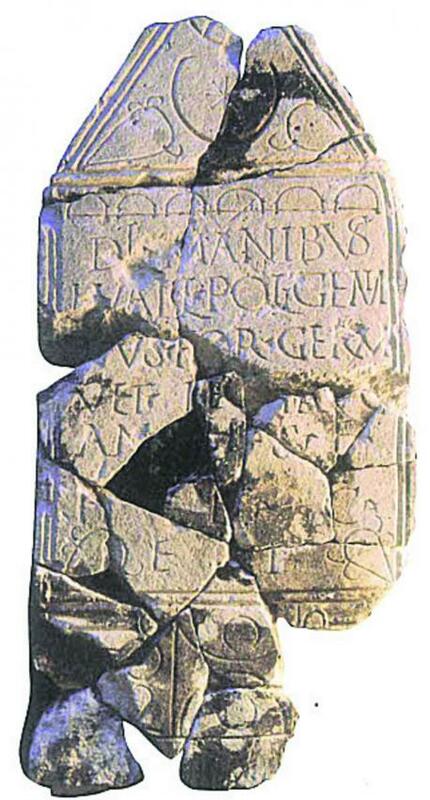 Written in Latin, the stone’s inscription reveals Lucius was born in northern Italy, joined the Second Augustan Legion at about 18, in Strasbourg, and served during the Roman invasion of Britain in 43AD during the reign of the Emperor Claudius. The legion was commanded by the future Emperor Vespasian, who was based at the new military fort of Alchester. After about 28 years of service Lucius retired, but stayed at Alchester with his wife and child. He died about four years later and his will requested his heir set up the tombstone. A special frame with foam backing and steel has been built for the tombstone. Peter Chivers, secretary of Bicester History Society, who helped reassemble the tombstone, said that in 43AD Alchester had a wooden wall, but it was replaced several hundred years after Lucius’ death and the tombstone was used in the foundations. The site is listed as a scheduled ancient monument, but is currently farmed. The tombstone goes on display at Woodstock museum from July 20.